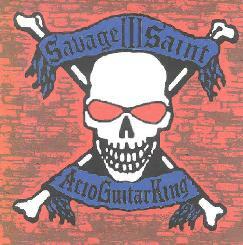 AcidGuitarKing - "Mother" / "Savage Saint II" / "Savage Saint III" / "9"
Here we go folks. A new crop of AcidGuitarKing releases from the prolific Mike Wingate. I'm going to start by saying that Mike is one of my favorite guitarists these days. Here's the thing: You won't come away from an AcidGuitarKing album having been blown away. And you won't come away feeling like you've heard something new and innovative. What you will come away feeling is inspired... satisfied... like you've spent an hour on a private journey with the artist. It's easy to get lost in an AcidGuitarKing album and wonder where the hour went. Like meditation for psychedelic metal heads. And Wingate has his own voice to be sure. His guitar is highly articulate and expressive, with a sense of melody that makes each track the musical equivalent of a short story. Kind of like the stoner-psych equivalent of Joe Satriani with the ghost of Hendrix looming in the background. 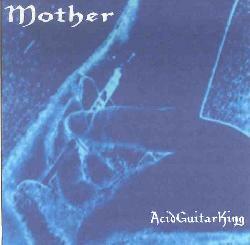 The latest from AcidGuitarKing is Mother, which includes plenty of the potent and highly passionate AcidGuitarKing sound. We've got Wingate's trademark thudding, volcanic acid metal marching with his expressive guitar soloing over the top. But Mike cranks out some upbeat shred guitar too on tracks like "Return Drive To Forever", "Trip Head" and "Space Sleep". "Trip Head" is an excellent rock n roll tune that might be a little something for Van Halen fans who are amenable to metallic stoner psychedelia. (Despite the analogy, Mike tones down the flash enough that you can absorb the melody.) And "Space Sleep" is one of the albums highlights, on which Wingate rocks hard in his slow but ultra powerful style, evolving through multiple themes across the songs 10 minute length and includes oodles of ripping guitar work over a nicely stoned foundation. "Star Of Orion" is an aptly titled song (penned by Helene Wingate) that consists of beautiful spacey keys and a mind-bending guitar sound that creates a thoroughly cosmic journey. The atmosphere is serene throughout most of the song, but a more commanding guitar takes over to bring us to the conclusion. 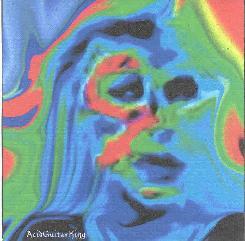 The albums other longish track, "In The Land Of AcidGuitarKing", is another standout track that is brimming with the trademark Wingate fire and emotion. And I really dig the drugged Blues of "Balance" and "Long Slow Death". An overall outstanding album. Judging by the song titles, Savage Saint II has a pretty dark theme, and the equally dark music matches up perfectly with the titles. 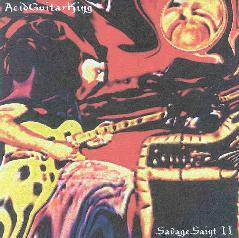 Songs like "Nomad", "Black 13" and "Face", all feature the classic AcidGuitarKing traveling melodic leads building upon a stoned base. And dig that tripped out shimmering guitar on "D.O.A.". This is one of those tracks I'd play for someone who asks, "why does he call himself AcidGuitarKing"? At less than three minutes "Slow Death" is the shortest track on the album, but boy does it pack a punch in terms of darkness and intensity. If this got developed a bit further it would be great for a horror movie. Both this and the next track, "R.I.P. ", are embellished with haunting but very spacey atmospherics. "Junkie Parade" showcases Wingate's molten brand of drugged out stoner metal with the guitar adding the color and fire. Eight great minutes of crushing power and ripping psych guitar. "January 10th" and "Darkness Dawn" are both very cool Bluesy stoned psych rockers. There's some pretty swingin guitar on "Revenge", though it's also one of the more purely acidic tracks of the set. "In Memory Of" turns on the spotlight with some absolutely ripping mindfucked psych-rock guitar. Less than 4 minutes... damn!! I wanted this sucker to keep on going. BUT... my disappointment didn't last as the heavy trip theme continues on the next track, "Outlaw King", which includes cosmic rockin dual guitars. Another excellent album. And what better follow up to Savage Saint II could there be than Savage Saint III? I don't have a lot to say about individual tracks on this album (though "Mirror" is an interesting tune, having a bit of a 60's feel). But don't think for moment that means Savage Saint III is a lesser performance than the others. This is a ripping hard psych-rock set and includes some of the most killer wah'd, wailing and winding guitar work heard on any of the AcidGuitarKing albums. And though this doesn't deviate radically from Wingate's usual style, there are moments in which he sounds like an acid drenched version of Rick Ray, another hard rock guitarist I've written much about in Aural Innovations. Hendrix also comes to mind much more than usual, particularly on "Psychedelic Sub". And the rest is just deliciously hard and ultra stoned psycho-acid-metal, played with the usual AcidGuitarKing flair for passion and narrative flow. In summary, if you haven't heard any of Mike Wingate's music yet and are intrigued by these descriptions then you need to get off your duff and check him out. Existing fans should note that Wingate is putting a band together so he can hopefully do some live shows in 2004. And this band will include a vocalist! Wow, I've gotten used to Mike's guitar being the "voice" of his music so this should be very interesting. For more information you can visit the AcidGuitarKing web sit at: http://www.acidguitarking.com. Hear songs at the AcidGuitarKing Mp3.com site at: http://www.mp3.com.au/AcidGuitarKing.